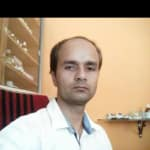 Dr. Anuj Kumar Rai is a popular Homeopath in Bhilai, Durg. He is currently associated with Gangotri Homeo Clinic in Bhilai, Durg. Book an appointment online with Dr. Anuj Kumar Rai and consult privately on Lybrate.com. Lybrate.com has a number of highly qualified Homeopaths in India. You will find Homeopaths with more than 36 years of experience on Lybrate.com. Find the best Homeopaths online in Bhilai Durg. View the profile of medical specialists and their reviews from other patients to make an informed decision. Hello Dr. I'm Aditya and I'm suffering from headache pain since last one month please consult me about tha medical treatment. Hello avoid night watching sleeping time 8 to 10 hours take homeopathic medicine 1- belladona 30 four pills three times a day for 1 week. I am 19 year old female. I've never experienced breathlessness low bp (89/53) and dizziness before that viral fever in february. I also consulted an ENT doctor at that time. He ran an ECG which showed everything normal. But now I feel like extreme weakness and body ache. There is profuse sweating in my palms all the time. After climbing stairs or walking distance I can hardly breathe! Whenever I do some work it feels I am having mild fever. My periods are late and extremely painful this time. I have lost my appetite to a great extent. The doctor gave me nutritional supplements. But I still don't feel good. What's wrong with me and what should I do? Hi lybrate user avoid cold thinks like ice or cold water avoid climbing avoid walking long distance take homoeopthic medicine 1- natrum mur 30 four pills two time a day for 1 week 2- pulsatila 30 four pills three times a day for 1 week 3-bryonia alba 30 four pills three times a day for five day 4- ashoka q 20 drops half cups water two time a day for 1 week avoid pain killer avoid junk food take food high fiber & protein. Sir my back pain and uric acid problem many Now mane kaso farak padyo nathi please cjek and replay. Hi lybrate user take boil water 8 to 10 glass in 24 hours take homoeopthic medicine1- colchicum 30 four pills three time a day for 1 week 2- ledum pal 30 four pills three time a day for 1 week 3- urtica urens q 15 drops half glass water two times a day for 1 week avoid alcohol. I will drink lemon water at that time, but still my bp id getting low and getting severe stomach pain. Hi lybra+e user avoid the sour things take the glucose mix with water take the homoeopathic medicine1- natrume mur-30 four pills (two times a day) for five day, 2- colocynth -30 four pillls thrice time a day for 1 week. I have been suffering from sleep disorder for the past few years. Without the support of sleeping tablet or a couple of alcoholic drink I will not be able to sleep. If I don't take either of this it will take a very long time to fall asleep and that too will be a very disturbed sleep. Please give me some advice to overcome this. Hi lybra+e user avoid sound in sleepy time take homoeopthic medicine1- nux vom 200 four pills in night time for one week 2- avena sativa q 20 drops in half glass water two times a day for one week avoid laptop, mobile in sleeping before. Sir mujhe headache rozana hoti hai BP hamesha low rehta hai please give me some solution? Hi lybrate user avoid the alone take homoeopathic medicine natrum mur-30 (four pills one time) for seven day take homoeopathic medicine belladona-30 (four pills thrice a day) for seven day sleep eight to ten hours. I am suffering from a cough from last two weeks and I have chest pain when I cough hard what should I do for it? Hi lybrate user, avoid coffee, tea avoid cold water avoid rice in dinner take boil water 8 to 10 glass in 24 hours take homeopathic medicine bryonia alba-30, 4 pills thrice a day for five day take homeopathic medicine bio no-6, four tablets thrice a day for five day. I am a 48 years of age and I feel cold and wet below the knees and also in the feet during winter especially when the Temperature is below 23 degree. Hi lybrate + e user avoid the cold thinks avoid the cold atmosphere winter cloths cover the below knees bathing after dry the below knee rubbing massage in night or below the temperature in knee area.